An armored, scarlet-colored, fire-breathing, seven-headed sea monster with ten horns and full of blasphemous names that leaves behind a shiny wake. This beast was created on the fifth “yom” and resides in a watery abyss. Leviathan will kill the two witnesses of Enoch and Elijah at the conclusion of their 42-month testimony in Jerusalem, then Yahoah will slay her with His sword. Leviathan’s skin will be used for sukkah and her flesh served at the Marriage Supper of the Lamb. Job 41:1 “Can you draw out Leviathan with a fishhook? 6 Will the traders bargain over him? 11 Who has given to Me that I should repay him? 13 Who can strip off his outer armor? In footnote b for Job 41:1, Leviathan is identified as a crocodile; all others refer it it as a sea monster. Psalm 74:14 states that Leviathan has multiple heads, so a crocodile can certainly be ruled out. Isaiah 27:1 identifies it as a twisted serpent or dragon who lives in the sea. Leviathan and other sea monsters (Heb. tanninim) were created on the fifth day (Genesis 1:21). Revelation 17:1-13 — concentrating on v3 — states that the beast that rises out of the sea has SEVEN heads. Many will state that this is figurative only due to vv9-13, but it is both literal and figurative. The literal beast that will arise from its watery abyss and align with the forces of darkness is Leviathan. 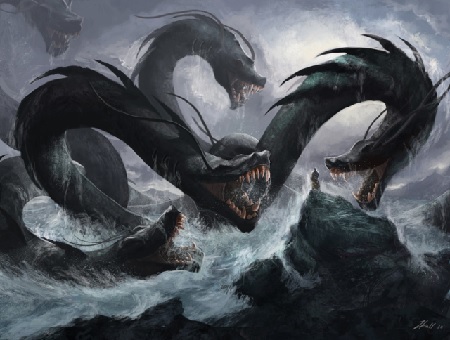 Isn’t it interesting that mythology borrowed from reality in the form of the Lernaean Hydra? It even has regenerative properties when a head is fatally wounded. Note in Isaiah 27:1 that Yahoah will kill the “twisted serpent” and “dragon who lives in the sea” with His fierce, great, mighty sword. How did Heracles/Hercules kill the multi-headed Hydra? With his sword and fire! In Sumerian, Babylonian, and Assyrian mythology, Ninurta slayed the seven-headed serpent. The only difference is that the Biblical account has been prophesied and has not yet occurred. Did the Biblical authors borrow from mythology or vice versa? Just like the Biblical Flood, mythology had a basis in reality. Some of us may actually witness this FIRST HAND towards the end of the Great Tribulation! But, before her destruction, she will kill the two witnesses of Enoch and Elijah; even the Jewry knows to expect the latter before the conquering Messiah comes (Malachi 4:5)! More information on the allusion of Jerusalem’s being Mystery Babylon may be found here. Recall that numerous cities were allegedly built on seven hills, but few realize that Jerusalem is among them. As is discussed in my Mystery Babylon article, the modern Jewry follows a Babylonian calendar, places more faith in the Talmud Bavli than the TaNaKh (OT), and recites “Adonai” for the Tetragrammaton invoking the Greek Adonis (who is the assimilation of the Babylonian Tammuz). That is why Jerusalem is referenced as Mystery Babylon — not to mention the divination and sorcery performed by “learned” Kabbalists; see Revelation 18:21-24 concentrating on v23. While on the subject of divination and sorcery, the Sigil of Baphomet spells out Leviathan (Heb. lamed-vav-yod-tav-nun) counter-clockwise starting from the bottom on their pentagram. THIS IS THE MARK OF THE BEAST – THE SIGIL OF BAPHOMET! Even Satan‘s minions understand what is to come more than most “Christians.” Within the context of Judgment Day on a future Yom Kippur, it makes perfect sense that Satanists would select a Sabbatic Goat within an inverted pentagram in light of Matthew 25:31-46 concentrating on vv32-34, 41 and 46. Folks, this great banquet on Sukkot is none other than the Marriage Supper of the Lamb between Christ and New Jerusalem described in Revelation! To recap: A beast/sea monster created on the fifth yom* will kill Enoch and Elijah, the two witnesses, at the conclusion of their testimony, then she will be slain by Christ Himself. “NT-only churches” cannot completely understand Biblical prophecies without understanding the OT. Who is currently taught this in their church or synagogue and why not? *As is discussed in this article, a Biblical “yom” is slightly longer than a SI day — 4 minutes 58.2129230769 seconds to be exact — with the basis being a sidereal year. This can be proven at the equinoxes.